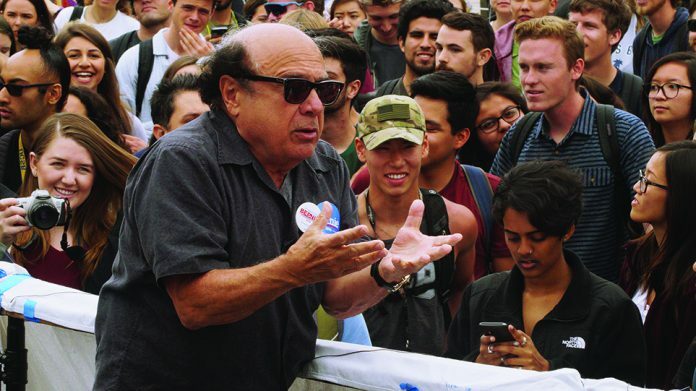 Hundreds of students swarm around actor Danny DeVito on Tuesday, May 17, as DeVito rallies students to vote for Democratic presidential candidate Bernie Sanders. Gustavo Gonzalez/Staff Photographer. Actor Danny DeVito paid a visit to the University of California, Santa Barbara campus Tuesday afternoon to promote student voter registration and his presidential candidate of choice, Sen. Bernie Sanders. Hundreds of students gathered in the Arbor on May 17 to watch the celebrity — known for his roles in iconic films like Taxi and One Flew Over The Cuckoo’s Nest — as he called student voters to action and decried forces like the corporate media for underestimating the Sanders campaign. The impromptu visit was arranged by organizers with student group UCSB For Bernie. Once he finished speaking, DeVito posed for selfies with students who completed their voter registration. California residents must register by Monday, May 23 to be eligible to vote in the state’s June 7 primary election. UCSB For Bernie head organizer Eric Villalobos said he and other members were notified about two weeks ago that a celebrity affiliated with the Sanders campaign would appear on campus. After several hints from the campaign, the group received confirmation yesterday that DeVito would be the guest of honor. At one point, DeVito held out a Sanders campaign condom for the crowd to see. The condoms — depicting Sanders and reading “Feel The Bern, Not The Burn” — were sold for a dollar apiece to rally attendees.